through my hands: Craftsmanship through the Decades & Challenge! Craftsmanship through the Decades & Challenge! Now that's WEARING happy colors! It's wet, chilly, and dreary this week where I live in Oregon, but life is great. I have all the conveniences and benefits of living in the 21st century. Today, I pulled out a small booklet that my mother-in-law found and gave to me called Grandma Dexter, Applique and Patchwork Designs. The cost on the worn little booklet was only 10 cents. As I gently leafed through the pages, I felt a connection to all the women (and men) who came before me in working with fibers. After doing some research, I learned that the booklet was most-likely published in the early 1930s. I cannot imagine how difficult it was to live during the depression. I like to think that receiving this booklet brought a little joy to someone if even for a little while. The designs and ideas in the book are happy looking. The first page has six different Sunbonnet Sue's doing different things. Yo Yo pillows were popular as well as pot holders. I was surprised to also see rug hooking kits for sale (everything incl.) 89 cents! The next several pages were full of color pictures of blocks such as the Eccentric Star, Sunflower, Modern Tulip, Flower Basket, Sweet Pea Wreath, Oriental Star, Dublin Steps, Triangle Puzzle, Colonial Bow Tie, Jacobs Ladder, Building Blocks, and Flower Pot. Templates follow the designs so that you can trace them out and start making them right away. This particular booklet still has the envelope and order form inside it should the person receiving it wanted to order supplies. Times sure have changed because at the bottom of the form it says "If cash is sent in payment be sure to register your letter). Wow. Dissolve 2 teaspoons of sugar in one-third cup of water, dip bouquet and leaves in this solution and press out liquid. Straighten flowers and leaves carefully and let dry. I smiled when I read at the bottom of the page that the booklet was Printed in U.S.A. As a nation, we have lost a lot of things that were made in America and while there is a push to bring back some, we will never be strong in manufacturing as we once were. Here's a picture of the letter Virginia posted in the booklet. Click on the picture to enlarge. So what do you do with your hands that makes your heart sing? Now let's continue to do it, but don't forget to also teach someone what you do so that each new generation will know the joy of creating, and you never know...that passing on of knowledge/skill might just give another person the ability to make a living income. If you've read back on my posts, you know how I feel about the connection of hands. Many hands working together can do anything. Now that we can touch anyone, anywhere via the internet there is nothing that cannot be accomplished if only we reach out to another. Which brings me to "THE CHALLENGE" and the REWARD for accepting the challenge. Leave me a comment on this post letting me know that you are willing to teach another person(s). Please post what you will be teaching. It can be whatever you like to do and have a passion for doing. Saying it out loud or in this case writing it, will make it more real for you and me. Now ask a person if they would like to learn what you have to teach. Ideally, teaching would be wonderful if we could always meet face to face, but teaching something new on your blog will work as well as long as you call the title of you blog -- Passing it On and link back to this post on my blog. Are you willing? Can I hear an Oh YEAH out there. Doesn't it sound like fun and it will bring you and others joy I promise. You might just find out that you teaching as much as doing. The Challenge is open until Friday, February 27, so you have plenty of time to complete it and be eligible for the gift. Please come back to my blog on the 27th. I will have a new post just for the Challenge. If you taught your skill person to person, awesome! Just let me know that in the comment section. If you taught your skill via your blog, please post the page on your blog so I learn from you too! I'll draw the winning name on Saturday, February 28 and post the winner. Please make sure I have a way of contacting you. If your email is hidden and you win, I cannot tell you or mail you your prize! Oh yeah -- that brings me to my gift to one of you willing to take on the challenge. 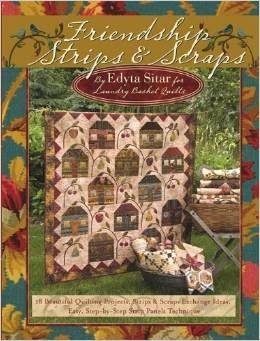 It is a brand new book by Edyta Sitar called Friendship Strips & Scraps. It was published in 2010 but the book itself is brand new and has that new book smell....yummy! Edyta is a fabulous teacher/person and what better way of saying thank you for teaching, then rewarding someone with this book. This Challenge is open Worldwide. I will ship anywhere. I should post one, just as you have done and share that way. I love them. Hi JoJo, I really enjoyed reading this blog, thank you. I already have the book (it's wonderful) but just wanted to comment on how interesting this blog was. I had never seen a 'Dublin Steps' block before so I might have to try and make one as I come from Dublin, Ireland. Greetings from a beautiful sunny Ireland today. Rita.